Sometimes it is not what you make, but how you put it all together. Our Northwest Eggs Benedict is kind of like that, I do not make the bread nor smoke the salmon, but the way that you combine and choose the ingredients is what makes the dish so great! We are very lucky here in Seattle to have a lot of really great local bakeries. I can on any given day get a fresh loaf from the Essential Baking Company, the Grand Central Bakery, or Macarina Bakery to just name a few, all are baked right here in town and delivered to grocery stores right near the Inn. Yesterday I used slices of Grand Central’s Como Bread. Note that fresh Country Sourdough, or Ciabatta, also works well and here is what I did with those fresh bread slices. I brushed the slices lightly with olive oil and then put them in a 400 degree oven to toast. I brushed both sides and turned them over about every 5 minutes till slightly crispy. I then poached an egg. Put a little vinegar in the poaching water and it will help keep the egg whites together around the yolk and not float in little bits all over your pan. I am not good at free hand poaching so I cheat and do use a poaching ring that I set in boiling water with a little vinegar in it. Top the bread with the poached egg. Top the egg with a slice of smoked salmon (I buy Lox trim at my local grocery store) and then top it all off with your favorite Hollandaise Sauce and it is ready to serve, and EAT! 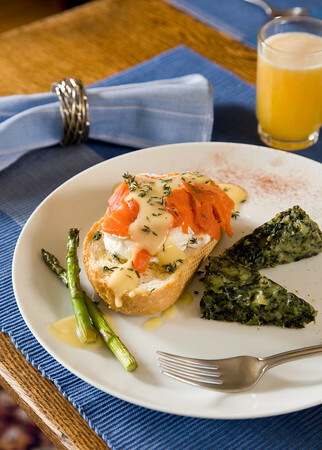 A little bit of Paprika or Fresh thyme lightly dusted on top adds a bit of color and flavor that mixes nicely with the salmon and hollandaise. This is my staff’s favorite breakfast and we serve this with Spinach Brownies on the side. YUM!!! P. S. the recipe for Spinach Brownies comes to us from Ellen at the Birchwood Inn and is indeed posted on this very blog!